Persistence Market Research (PMR) provides an exclusive analysis of global Plastic Waste Management Market in the revised report titled “Global Plastic Waste Management Market: North America is estimated to account for Significant Market Share during 2018 - 2026”. The main aim of this report is to offer exhaustive analysis and provide insights pertaining to the Plastic Waste Management market. This report offers a comprehensive analysis of the global Plastic Waste Management market in terms of market Volume (KT) & value (US$ Mn) and year-wise (Y-o-Y) growth in the global Plastic Waste management market according to resin type, source of waste collection and nature of service. For better understanding of the market, the report comes loaded with analysis of factors, such as drivers, trends, restraints and their impact on the market dynamics. The report is segmented into four sections by resin type, by nature of service, by source of waste collection and by region. Last section of the report includes competitive landscape, which includes market share analysis and provides information and analysis of companies based on categories of manufactures and service providers across the value chain and their presence in the global Plastic Waste Management market. Plastic waste management market’s volume was inferred through in-depth secondary research and validated from industry experts and key manufacturer/ solution providers through primary interviews. Each interview was thoroughly analyzed and average plastic waste management market volume was deduced and reconfirmed prior to incorporation in the report. For the estimation of global plastic waste generation, per-capita solid waste generation across various countries was also analyzed. For the plastic waste management market analysis, we have considered 2017 as the base number with estimated Plastic Waste generation in 2018 and forecast has been made for years 2018 to 2026. The plastic waste management market size is calculated with different resin types of Plastic Waste Management and based on their selling price in respective regions. Further, data points, such as nature of service split, source of waste collection split and regional split, along with qualitative inputs from primary research have been incorporated to provide precise plastic waste management market analysis. The forecast presented in this report estimates the total revenue projected to be generated across the Plastic Waste Management market over the forecast period (2018–2026). In this report, we have conducted forecast in terms of CAGR and analyzed market on the basis of Year-on-Year (Y-o-Y) growth in order to understand the behavior of the plastic waste management market and identify opportunities in the Plastic Waste Management market. Moreover, for a better understanding of each segment’s growth, we have analyzed the global Plastic Waste Management market in terms of Absolute Dollar Opportunity and Basis Point Share (BPS), which provides in-depth information about potential resources and key trends involved in the Plastic Waste Management market. 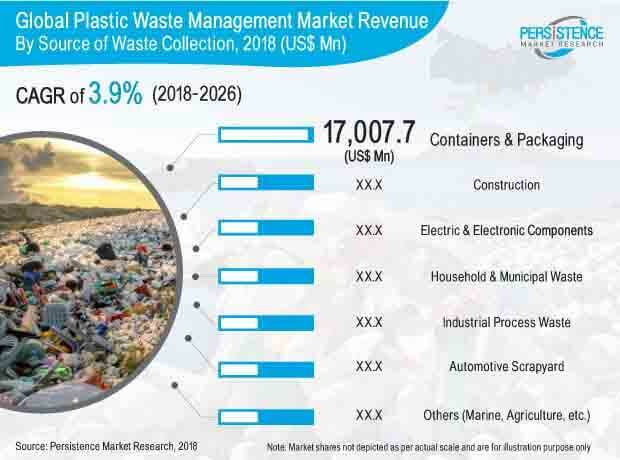 Along with this, PMR has used market attractive index, which provides information about the performance and growth of each key segment in the global Plastic Waste Management market. Plastic Waste management involves various activities, such as plastic waste disposal and plastic waste processing. There are 3 different plastic waste processing activities: incineration, recycling and others. The global Plastic Waste Management market is estimated to have been valued at US$ 33,681.2 Mn by 2017 end and is expected to reach US$ 45,642.4 Mn by the end of 2026 while expanding at a CAGR of 3.9% over the forecast period. The global Plastic Waste Management market is anticipated to represent incremental opportunity of US$ 11,961.3 Mn between 2018 and 2026. In terms of volume, the global Plastic Waste Management market is estimated to reach 137,096.1 KT by 2018 end and is anticipated to increase to 174,503.3 KT by 2026 while exhibiting a CAGR of 3.5% over the forecast period. Plastic is a persistent and toxic material. It comprises 5% of Municipal Solid Wastes (MSW), which is a major threat to the environment. Nowadays, plastics are used in day-to-day life for various purposes, which leads to tonnes of plastic waste in our surroundings. Utilization of plastic waste in road construction can reduce the cost of construction as well as pollution index of environment to an appreciable extent. On the basis of the nature of service, the global Plastic Waste Management market is segmented into disposal and processing. The processing segment in the plastic waste management market is further divided into incineration, recycling and others. The processing segment accounted for more than half of the overall plastic waste management market by the end of 2018. Growing ban on landfills across various European countries is expected to push the demand for plastic waste recycling activities in near future. The North America Plastic Waste Management market accounted for a significant value share in 2017 and is forecast to maintain its dominance in the global Plastic Waste Management market over the forecast period. Top 5 countries in Europe are expected to account for around 3/4th of the European plastic waste management market share by the end of 2018. Rest of Europe in the plastic waste management market is anticipated to create significant incremental opportunity between 2018 and 2026. Top 2 countries in the MEA are expected to account for more than half of the overall plastic waste management market share by the end of 2018. Some of the market participants reported in this study of global Plastic Waste Management market include B. SCHOENBERG & CO., INC., Advanced Environmental Recycling Technologies, Inc., REPLAS, Clear Path Recycling, PLASgran Ltd., Custom Polymers, Inc., CarbonLITE Industries, LUXUS Ltd., wTe Corporation, KW Plastic, Inc., Kuusakoski Group, Shanghai Pret Composites Co., Ltd., Republic Services, Inc., Reprocesses Plastic, Inc., 4G Recycling Inc., Vanden Global Ltd., TerraCycle, The WasteCare Group and Veolia Environmental SA. Prominent players involved in the global Plastic Waste Management are focusing on expansion of their processing facilities in the developing economies to meet the ever-increasing demand and gain share in the market. The global Plastic Waste Management market is one of the most fragmented markets as there are a large number of local players involved in the recycling and disposal of plastic waste.